This was a day for sightseeing led by composer Hyo-Won Woo and some other wonderful young composers and singers of the choir who joined us. The first destination was my choice--the traditional Korean artisan shopping district of Insa-dong. This area is full of medium to high end art galleries, artisan shops, jewelry stores, and so on. A bit of it is slightly “touristy” but it’s pretty easy to spot the excellent shops and ignore the touristy ones, just like you would in any city with a district like this. I found some cool things to take home to Sherri and Aidan and we had another traditional Korean lunch including one really spicy dish which was quite yummy. 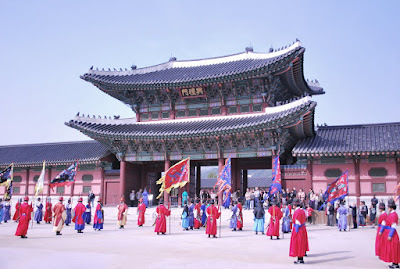 From there we went to the 13th century Gyeongbokgung Palace, a compound of many buildings, which have gradually been restored to their original condition. This was an amazing place, and you could really feel the history around you. The architecture and decorative details of the buildings are mind-blowing, and every few minutes various historically accurate rituals were played out by people dressed in period costume. After this visit to a very historic, beautiful place we met up with singer Hye-Sook Paick and went up to the Seoul Space Needle where you can see out over the whole city. 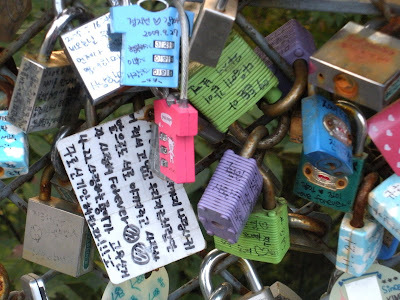 This was an amazing little sidetrip and they also have a tradition at the top-- lovers, husbands and wives, or families can write a wish for happiness on a lock, and then entrust the universe to make their wishes come true as they attach the lock to a long fence and then throw the key over the side of the hill. 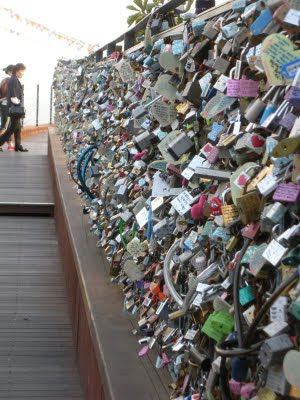 There were tens of thousands of these locks attached there- it was very cool! 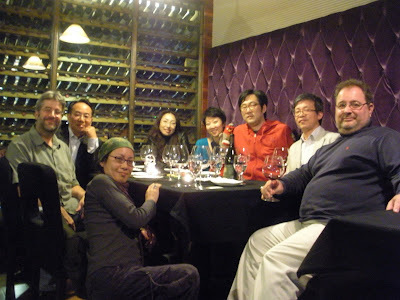 We still weren’t done, as it was dinner time and we met up with Hye-Sook's husband, Kyoo-Sang Choi, and sat down to what he described as a working class dinner at a small restaurant. Even on a weekday, the place was packed and I learned more about Korean culture as we roasted our own meat on the little vented individual grill at the table. Some of the small side sauces were delicious and we even roasted our own garlic for fun. 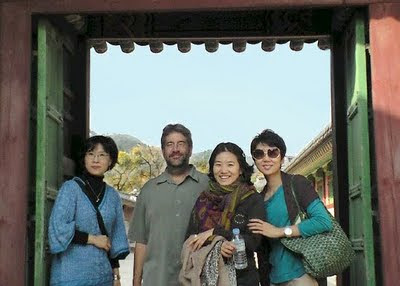 We then made our way all the way across Seoul to Puchon where Mrs. Woo lives. We wound up at a very posh and intimate wine bar there and folks asked me to pick out a wine. We went into the storage area and I brought out an Oregon Pinot Noir, as I figured they might like to taste an American wine they might not think of trying themselves. They liked the choice, but Mrs. Woo’s husband, who had joined us, found a better Pinot Noir from Australia to compare to the first. Cheese and chocolate entered the scene and we had plenty of fun chat, including with a very funny Canadian transplant named Nikola Schicchi (not Gianni!). He was great fun to talk to. It was finally time to pack it in- we had been sightseeing, eating, and chatting for about fifteen hours. The Korean people love to talk and socialize and I was glad that they wanted to do so with me- it was a great honor to be a part of this fun day celebrating Korean artisanry, history, food, culture, and friendship. The human voice can be a powerful vehicle. North Kansas City High School vocal music teacher Mike Shirley knows the strength of singing. He sees it every time his mixed choir gathers for practice and students from at least five different countries are brought closer together. In the past 18 months, the transformative impact of corporate singing in Shirley’s choir was made even more obvious with the addition of five Karen (pronounced "car-rin") students. The choir has become a kind of refuge, Shirley said, for young people who still have vivid memories of government persecution in Myanmar and life in squalid camps along the border in Thailand. "The thing that’s so unique is that they came to this country where they don’t speak the language and they’ve managed to thrive at our school and in this choir," Shirley said. "They’re a really amazing group of young people." With the help of North Kansas City Schools interpreter Paw Wah Tamla, student Bo Bo Htoo explained that the Karen are an ethnic minority that has been under attack for decades from the military dictatorship in the former Burma. All five students have multiple family members who were killed by government forces, Htoo said. "We moved to Thailand because the Burmese army came to our village and killed a lot of people," he said. "If my family had stayed, they would have been killed, too." Most Karen are Christians, according to the students, and they practice a form that emphasizes corporate worship and community well-being. Choral music, the students said, is a central facet of Karen culture. When they came to the U.S., singing at church and school became a way of staying connected with each other and building new relationships with their new neighbors. "Singing is very important to preserve our ethnic group," student Eh Htoo Na said. Kitty Robker works with students in the English-language learner program at North Kansas City High School. She was one of the adults who encouraged the Karen students to join Shirley’s choir. "Some of the other staff and I noticed that they loved to sing," Robker said. "We’d find them sitting together at lunch, singing. And their singing is so beautiful." As a way of educating his students about world music and to highlight the school district’s ethnic diversity, Shirley requires all of this choir members to come up with something they can perform that reflects their heritage. During a show last year, Shirley’s Karen contingent sang the hymn "We Can’t Live Without Jesus" in their native language. The response from the other students was great, according to Eh Hit Kaw. "People know more about where we’re from and who we are because of our music," Kaw said. At Dr. Yoon’s request I gave a three hour seminar on composition for about twenty young composers, as well as a few choral conductors who attended. The topic was “Craft and Creativity” and my premise was that a composer needs to address both issues and strive for balance. We had a number of long discussions about this and also wound up on tangents that were pretty cool. I talked a bit about African-American spirituals and the arranging process there, and they had a few questions about jazz as well, particularly how to add jazz elements into a score effectively. There were some questions about writer's block (composer's block?) which were tough to answer as this is usually not a problem for me. Dr. Yoon also asked me to give them names of American composers who are writing creatively for choirs. I mentioned Paul Crabtree, Matthew Harris, Ola Gjeillo, Stephen Hatfield, and the Canadian composer Stephen Chatman. I also found an opportunity to introduce the music of my friend Reg Unterseher to them; we examined his very beautiful setting of Sicut Cervus published by Oxford and I left Dr. Yoon with a number of Reg’s scores. All in all, I think the seminar went well and I made a number of new friends there. The folks in attendance seemed to be very serious about their work, and I appreciated that they wanted to subject themselves to listening to me for three hours! I also realize just now as I type that the majority of those in attendance were young women- so it appears that new Korean music has strong female leadership which I think is wonderful. After that, we had a nice light dinner at a nearby restaurant and Kelley drove me back to the hotel. I then hit the neighborhood streets all by myself and explored the neon of the night as well as the street vendor alley areas which extend for long distances behind the main streets. Here you can find vendors offering yummy street food, amazing produce & grains, every kind of fresh seafood you could imagine, including little squids staring back at you with their big eyes, toy shops, carpet and textiles, clothing; you name it- it’s there. My last stop on the stroll was a sweet little bar/café called “So Cool”, which was decorated very quaintly. Here are some random photos I took on my stroll. 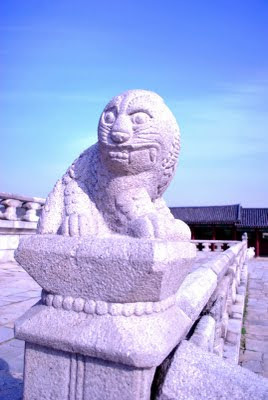 Next Post: Sightseeing in Insa-Dong and elsewhere, and a whole lot more Korean food! After the dress rehearsal Dr. Yoon, most of the choir management, my interpreter for the evening, and I grabbed a very light dinner at a sweet restaurant located within the Seoul Arts Center complex. 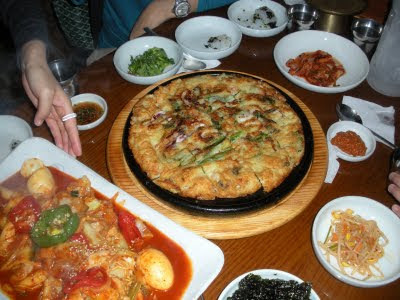 The fare was mostly Italian, and that cuisine seems to be a favorite non-Korean fare, and is prepared quite well. As concert time neared the lobby filled with more and more people and a great deal of excitement. These Incheon City Chorale concerts are seen as great events, and the audience would number over 2,000. I was glad to see a fair amount of families with grade school age children attending, even on a school night. The hall has excellent acoustics and in a few ways reminds me of the great hall design inside Disney Hall in Los Angeles- most noticeably the use of acoustically favorable woods on virtually every wall and ceiling surface. The concert began with the Missa Brevis Incheon and the singers launched into it sounding fully warmed up and ready to make great music right away from measure one. Perhaps some other choirs would have started off a concert with a shorter, simpler piece to warm up the audience and their voices, but not this group. They sang the Kyrie with great sensitivity and at times the basses led the way in the sound. I had especially noticed the power and richness of the basses in Oklahoma City and knew that I could write passages which would be purposely be bass-led. The Gloria started with the whirlwind bravura passage I was worried about- but this really was of no great difficulty for them and they ripped through the movement with great power in the fast and loud outer sections, and with great sensitivity in regard to some intimate tonal inflections in the middle soft part-wow. The Sanctus was sung with even more exciting bravura- the movement never lets up its forward drive, and the final three cadences build in intensity and in more and more divisi until all of the singers wind up on a very complex chord in their high tessituras at fff. Their singing of the last two pages or so made my hair stand on end, and I knew they were enjoying themselves. The final movement, the Agnus Dei, is obviously more intimate due to its text, and my setting employs some very lush harmonies. Once again, the choirs richness colored the sound in a beautiful way. When the piece was over, the audience reacted quite favorably and Dr. Yoon asked me to speak to the audience briefly. Through my very nice young interpreter, I was able to thank Dr. Yoon and the choir and everyone there for their wonderful graciousness, support for the arts, and so on. I was very pleased with the audience response to my music both during the concert and afterward in speaking with many of them in the lobby. Incheon City Chorale has a pretty sophisticated audience attending their concerts, yet none of them are music snobs. A few word about this choirs soundmodel- Dr. Yoon has assembled 48 professional singers in their vocal prime who project “formant sound” (sound filled with many rich overtones) in the way an opera singer is trained to project. This creates an amazing richness to the sound at all times, yet is still not at all impossible to “blend”, due to the commitment to fine musicianship from all involved. Dr. Yoon’s concept of choral tone should challenge English and American choirs who try to “blend” their sound by singing blandly toward some imagined warm and fuzzy goal; a mediocre goal which creates mediocre results. This type of non-resonant choral singing is actually becoming more and more a thing of the past- thankfully, because most of the time it just makes for a dull sound with no vibrancy or color, and also lacks any hope for wide dynamic range. The balance of the serious part of the program were some of my spiritual arrangements- Go Down Moses, Peter go Ring-a dem Bells, and the quasi-spiritual (on an interesting text by Natalie Goldberg) My Friend Elijah, plus an amazingly gorgeous and sensitive performance of Book Six of Monterverdi’s Madrigals. The singing of the Monteverdi was worth the admission price all on its own, in my opinion. In the spirituals the chorale especially brought out the story and drama of Go Down Moses--it was very rewarding to hear Dr. Yoon’s use of very specific dynamics to do so. There were some hoots and hollers in the audience for the big fff ending to Peter Go Ring-a dem Bells, an ending I enjoyed constructing! The final portion of the concert was what many in the audience were waiting for- folk songs and popular music which highlighted chorale’s love of showmanship and the joy they take in entertaining an audience (gee, could we start doing this more in the US?!). There were a number of pieces where the choir acted and danced, often with sly comedic intent. One of these was an a cappella arrangement of La Cumparsita wherein two of the singers in the choir strove boldly (but with winks and gestural asides to the audience) to outdance two professional tango dancers onstage. The audience roared with laughter as they sometimes danced well but sometimes flubbed too- but really their comedic talent gained the audiences favor, as all roared with laughter at the wonderfully broadcast inside joke. It was all a great witty choral/dance/comedy performance of great hilarity. What a great way to finish a concert for all the young people in the audience- to see that “classical music” could be deeply beautiful AND really entertaining and witty-- and not just for self-appointed aesthetes! Oh, by the way, the women of the chorale used three different outfits for this concert- all three were gorgeous and added some extra visual class and interest to the evening’s performance. After the concert ended there was great excitement in the lobby- the audience and performers mingled, Dr. Yoon’s entire church choir was there to applaud him, everyone was smiling and taking pictures, many choir directors attending approached me and I chatted with many people. We did a lot of photos and I signed a few autographs (that still feels strange to do) ad everyone went home happy and fulfilled. I was driven back “home” to my hotel and I relaxed with a very nice bottle of Spanish red wine that just happened to appear there. All in all, this was my most rewarding evening ever as a composer and I was so thankful to all the many people who contributed to the evening’s fun and success.